Did you know that the most popular month for weddings -- still, after 75 years of record-keeping -- is June? Well, if you ever tried to book a wedding in June, you might know. I was once a June bride -- Marriage #1 -- and I can tell you that it's a beautiful time of year, but in my area (the Northeast), it can be hot and stormy. LOL, kind of describes my first marriage, especially the stormy part! 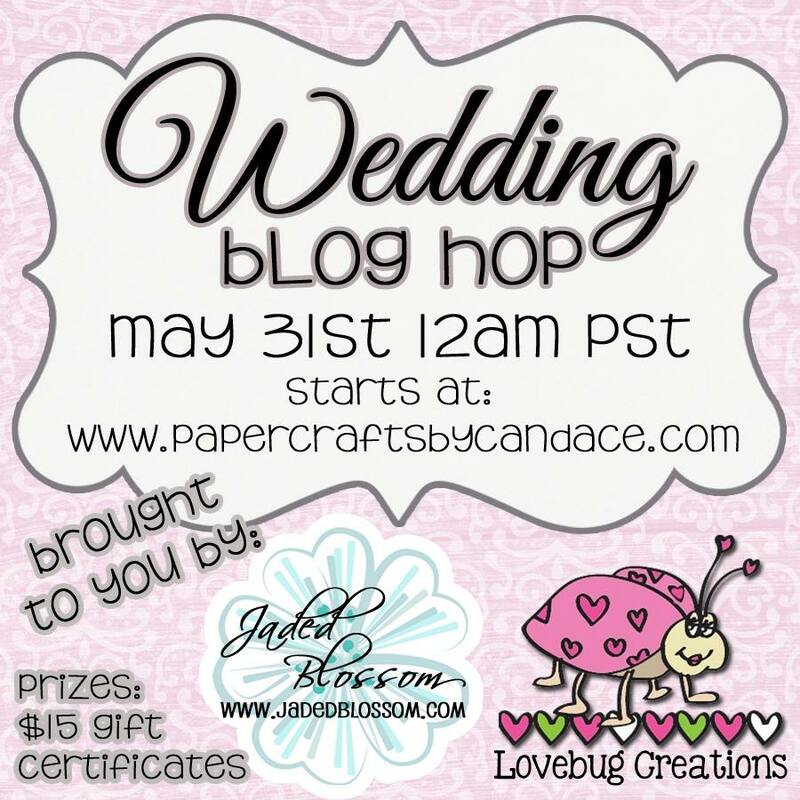 So anyway, let's get to the point of why you're here as we head into June: the Wedding Blog Hop, hosted by Jaded Blossom and Lovebug Creations, and featuring their respective creative team members. Lovebug Creations is featuring the release of their newest color, a luscious soft beige called "Buttercream." 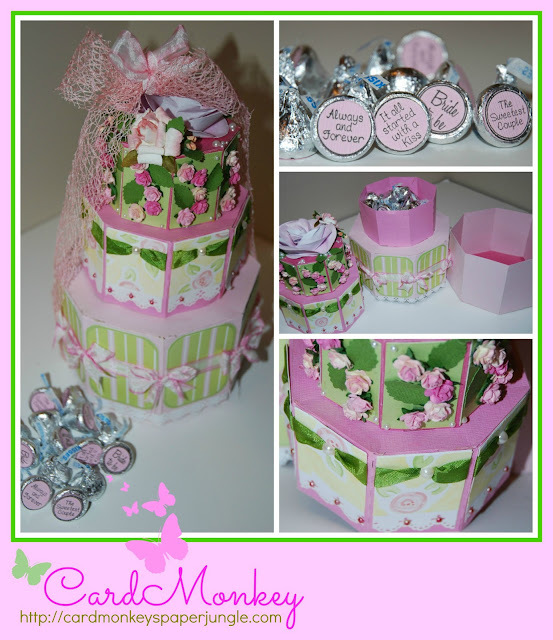 The "cake" is a three-tiered octagonal box which is a pattern available from the Silhouette Online store. I decorated each panel with different but complementing pink/green papers cut and embellished on each panel. For the bottom layer, I decorated the panels with a paper from my stash, accented by LBC Rumple Ribbons in Panther Pink On the Edge. At the lower edge, I tipped the panel with a piece of white cardstock cut with a Martha Stewart eyelet lace punch. On the middle layer, I again used the MS eyelet lace at the bottom, with a paper from my stash; LBC Rumple Ribbons in Green Leaves laced through a ribbon punch cut, topped with a half pearl. On the top layer, I used pink roses from Wild Orchid glued in a serpentine pattern on each panel, trimmed with leaves punched using a Punch Bunch leaf punch. 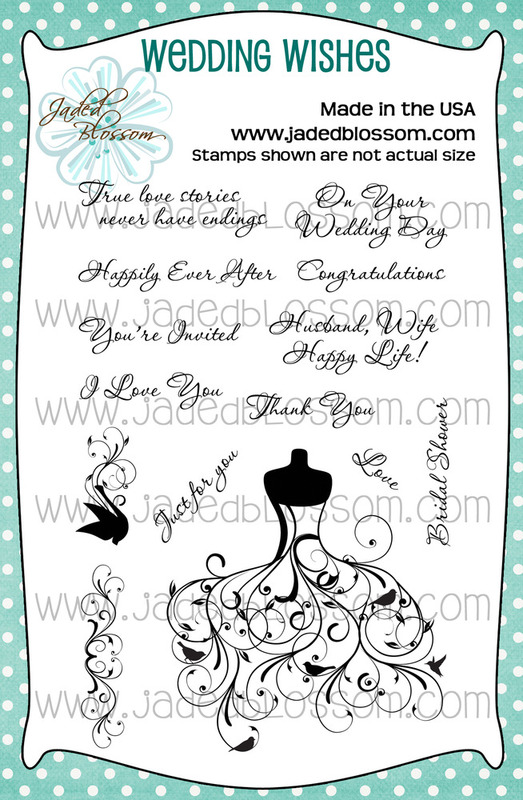 The top is capped by a rolled rose from Cricut Art Philosophy cartridge, along with more roses from Wild Orchid. Adhesive pearls dot the top as well. The top tier is unfillable, as I made it. 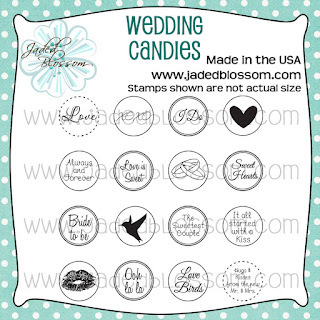 I filled the center tier with Hershey's Kisses adorned by punched sentiments from the Wedding Kisses stamps from Jaded Blossom. The bottom tier I left empty for now, thinking I may make circular thank you cards for the bride to use after her shower. Once it was filled, I tied the entire "cake" using Lovebug Creations' newest product, "Mama's Mesh" in Ballet Slippers, tied with another piece of LBC Rumple Ribbons. 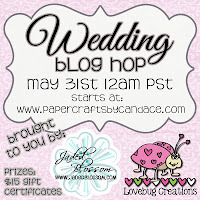 And our hostesses are offering Hop-wide blog candy, too! Thank you again for Hopping By!! Stunning!!! Amazing work and Details! 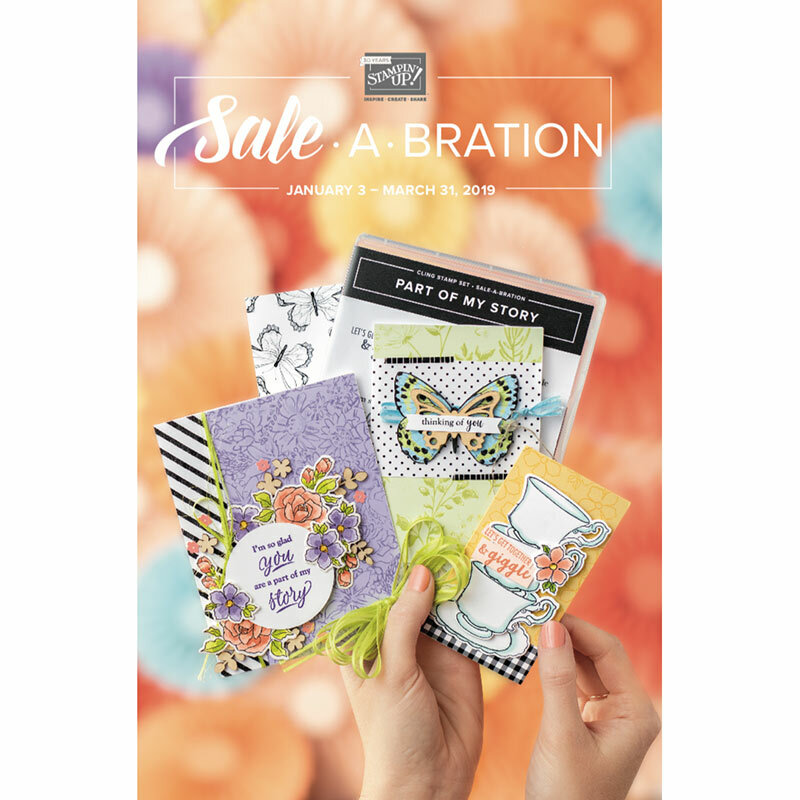 I always love stopping by the paper jungle to see what has come out of that creative mind of yours! Beautiful job! LOVE the mama's mesh on there too. This "cake" is amazing!!! You are truly incredible in everything you create Ellen! Fabulous job! Oh my gosh!!! Where do I even start?? This cake is amazing!!! Your attention to details ..wow!! Omg.. Wow!! You rock!!! Your cake takes my breath away! Stunning!!! And beautiful! You are ALWAYS amazing and I adored your "wedding" stories - the commentary always makes me feel a personal connection to you! The gorgeous cake is stunning! The colors and embellies really enrich your project - TFS! Oh my gosh, this paper cake is amazing! WOW, look at all the deets. Great job girl. And a very BEAUTIFUL cake! Love all the gorgeous flowers as well as the other details! WOW! This is off the charts amazing! I am FLOORED...and it looks good enough to eat. This is crazy amazing! You still continue to surprise me!!! Can't wait to see what you do next! Oh wow, this is amazing! Love the colors and the way you used the Mama Mesh!! This cake is to die for beautiful!! 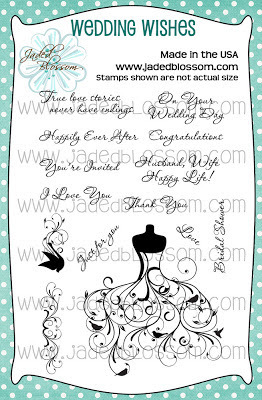 I love how you used different papers for icing, the flowers, ribbons, the whole 22 yards. You pasted the 9 yds, lol. If I were chosen, just send your project, lol. What an amazing wedding gift box set! 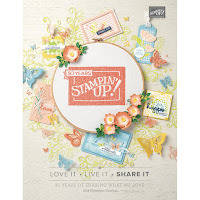 TY for the opportunity to win that gorgeous CTMH stamp set. WOW!!!! Great cake my sweet friend! That really had to take a long time to make. I really love the details around it. Awesome job as always! Your cake looks wonderful. Holds chocolate too; how can you miss! Oh my goodness! Your project is amazing... So beautiful and creative. I love that mama's mesh! Thanks for the fabulous inspiration! WOW! Again WOW! 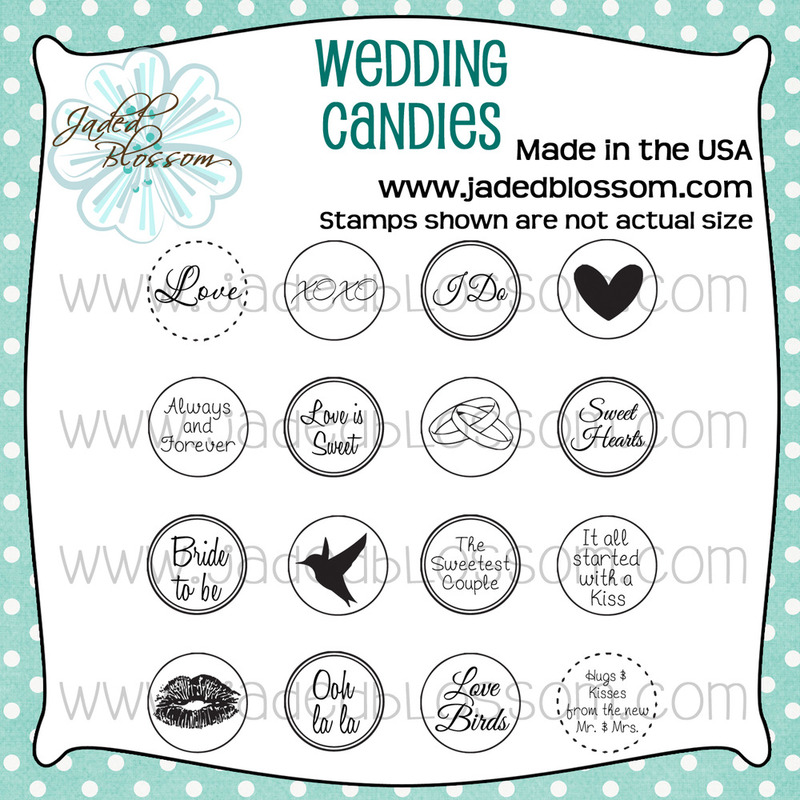 This is quite an assortment of useful things for the bride. The cake is stunning! Oooh...I love the pink/green color combo!! what a fun candy/treat holder! Yowza!! This is so pretty! I do hope you and your lambie have a wonderful evening! Ellen, your project is WONDERFUL!! So very elegant!! I wanted a June wedding but everything was already booked up! Love your project, the colors are especially beautiful! Your cake looks like a LOT of work but it turned out so nice! Lovely project and I like your thought process on buttercream! LOVE! LOVE! LOVE IT! 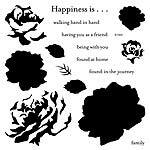 The flowers you addes are so pretty. TGFS. Absolutely amazing project. Thanks for sharing. amazing. lovely colors, great details! Gorgeous!! Love that ribbon.. its stunning! Love the papers, the flowers.. Just gorgeous!!! Love all the detail! So cool! Playing catch up,this is AMAZING! I LOVE IT! Wowza! You are the craft master! Just too pretty! This cake is amazing! 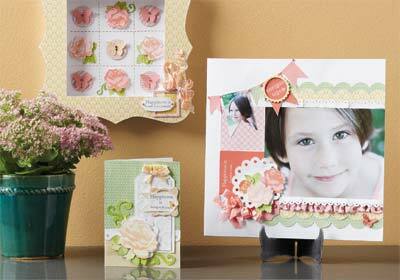 your project is super duper cute! thanks for the giveaway! Beautiful cake Ellen! Love the details, thanks for sharing and for the chance to win more candy!